You might think that it’s impossible for a vegetarian to eat in a steakhouse, but you’d be wrong. I should know – I just did it. As a new vegetarian, I was a little hesitant about heading to a fancy steakhouse for a work dinner with my husband, but I’m not one to impose my new lifestyle on others and went along. We went to Hideaway Steakhouse in Westminster, CO and, I must say, I hope all steakhouses are like this one (but I have a hunch they are not). Not only were they incredibly accommodating (they brought me extra bread while everyone snacked on meaty appetizers) and offered to make me a veggie pasta that’s not on the menu – which goes to show they accept all types of eaters. 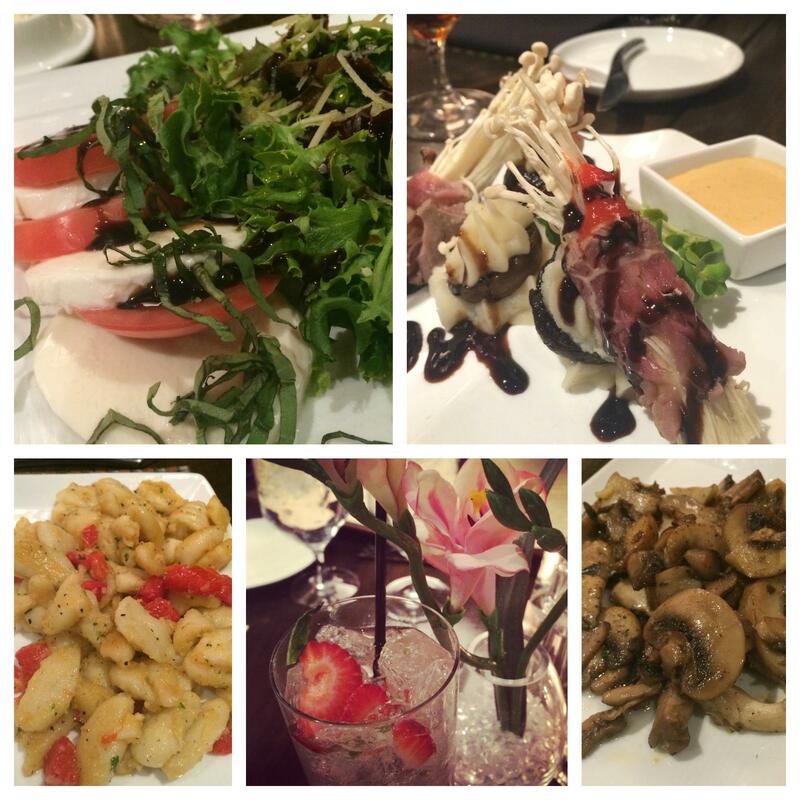 I ended up with a great variety of foods, including a caprese salad, garlic sautéed gnocchi, and a wild mushroom mix. It was incredible. So how do you remain a vegetarian while eating in a steakhouse? First, let people know you’re not eating the meat ahead of time (if you can) so that there’s no awkward conversation over dinner. Most steakhouses don’t offer vegetarian meals, but you can request one that’s “off the menu” or put together a stunning meal comprised of a salad and a few sides. Honestly, I had no idea this was an option and I would have been much less anxious had I known that beforehand, so I recommend calling ahead and getting the lay of the land. Now that I’ve offered you some tips, let’s get to the good stuff – photos. I’m not a foodie (though I might be becoming one) but I loved the presentation of just about everything at Hideaway and took entirely too many pictures (see below). If you ever find yourself near a Hideaway Steakhouse, I highly recommend stopping in. Oh, and the steak is apparently amazing, too, but I wouldn’t know. (PS: I didn’t eat the meat-wrapped appetizer but it was too beautiful not to share). Have you ever been nervous about a new restaurant?